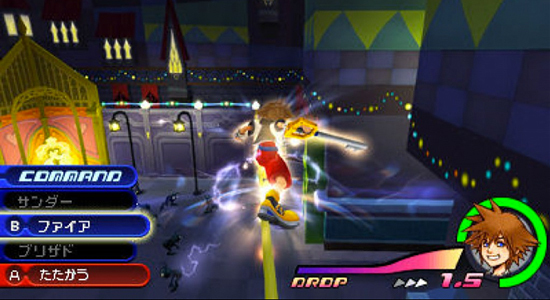 Will KH: Dream Drop Distance be a worthy purchase for KH Fans? For our weekly blog, Arcane, a member of the Kingdom Hearts fan community, gives his thoughts on the announcement of two additional Kingdom Hearts spin-offs. This week, he’ll give his thoughts on Dream Drop Distance. How did he feel about yet another side-game? Does he see potential in this spin-off? Could this game be similar to Chain of Memories? Read for yourself! Developers can be accused of a lot of things, such as being opportunistic moneymakers (which is true–it would be silly to be otherwise), but one thing that’s hard to pin on them is the lack of sense or lack of awareness. Developers often have as clear a view of the problems that are going on with their products and game lines as anyone else, if not better since they can access the stats for it. If a bunch of fans notice a shrinking demographic in who’re buying the games as the years go on, the company behind it was probably the first to make that discovery. If the principle reason people are leaving the game series is because of the length of time for its development, most companies will try and work on that (Duke Nukem Forever is a clear break of this concept). Up until I started thinking along those lines, I was leaning on the side of those who thought that the announcement of Dream Drop Distance and Birth By Sleep Volume 2 was proof that Square Enix was punking the fans; despite the fact that I knew Nomura’s normal crew were still busy with other projects like Final Fantasy XIII Versus, I assumed that these two games were just there to milk more money out of the franchise. Then I had this little thought and realized that Square Enix, like any other corporation, is not without a long-term agenda here. If they got to the size they are now, they have to know something of what they’re doing. They probably could have pulled together a crew and gotten to work on Kingdom Hearts 3, or some other option. Instead, they offered the fans two more games while waiting for Kingdom Hearts 3. I could sit on my laurels and assume the worst, but I think we’ll gain more from trying to see what developers and players alike will be getting from the next two games that make the wait worthwhile. Now, I’ll be honest about 3D in general: it has always sounded like a gimmick to me. Not the game–I mean the technology. When the 3D movies made a comeback, I rolled my eyes. When they announced 3D gaming, I thought about how that would improve my gaming experience and came up with zilch (although now that I think about it, some moments in Alan Wake would have been tight in 3D). Having seen two movies in 3D has not changed my opinion. Game Informer‘s plethora of articles about the 3DS did little to curb my lack of enthusiasm. Sure, another spin-off to a successful franchise would be lucrative to any business, but some fans are starting to get a little disgruntled. So, as you can imagine, when the next game announced after Birth By Sleep was Dream Drop Distance, I got tired with Kingdom Hearts for the first time. Waiting for Birth By Sleep was made easy by a two year vow of gaming abstinence, but being told I’d have to wait for Kingdom Hearts 3 while they still managed to make the time to put out yet another gimmick-laden game was enough to make me to groan. Finding out that the story was supposed to be about the Mark Of Mastery exam did little to improve my mood on the subject, and finding out that the visuals were looking to be based off the original Kingdom Hearts did less. Comparing what we had on 3D to what Birth By Sleep presented just didn’t add up to anything new and the game seemed worthless. The same character design from the first Kingdom Hearts especially made me feel like the franchise was stuck in the mire. All in all, I had really, really low expectations of this game. So why was this an answer for the aftermath of Birth By Sleep? We can, of course, say that there was a deal between Square Enix and Nintendo to release a game that would help promote the 3DS–and there probably was–but that honestly doesn’t get us anywhere. It’s also worth noting that all those opinions were formed BEFORE the last trailer came out. And to be honest, that’s what started me thinking. 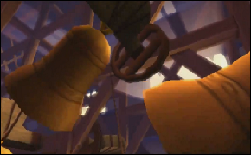 The Hunchback of Notre Dame finally appears in Kingdom Hearts, but it's in a spin-off! Do you think they'll do a "prequel" storyline a la Lilo & Stitch in Birth by Sleep? First off, purely from a mechanical point of view, if the 3D works, it will be fantastic. Well, maybe not fantastic, but the gameplay’s parkour style, alongside the sense of depth created by the technology, will make the obscene jumps, slides, falls and other tricks of the game potentially breathtaking. The parkour by itself is an aspect of the game I’ve greatly desired since Kingdom Hearts 2 started showcasing some crazy defiance of physics with reaction commands, and, while it’s been confirmed that some aspects need some work to be intuitive to use, the idea of bouncing around whole areas is still something I’m psyched for, and I hope that they incorporate it into Kingdom Hearts 3 with the feedback from this game. I think that’s part of the reason they wanted to make this game: to try that aspect out so it can be perfected in Kingdom Hearts 3. Speaking of Kingdom Hearts 3, the announcement of Notre Dame as a new world indicates that this side-game is going back to side-game roots–as a preview for the future. Think about Chain of Memories: with that, we got a look at the villains and one of the new worlds, with hints about one of the major players, Roxas, and some of the themes and trials that were fated to come. 3D seems to be heading back in that direction, where many of the other side-games didn’t. We’ll be seeing new worlds, there are hints of seeing a new look for Sora and Riku, and we’re bound to get hints of how Xehanort is going to manifest to make his final move. While it doesn’t quite make up for Kingdom Hearts 3 being so late, I don’t recall people complaining about Chain of Memories as a preview either. At least the series is moving forward. Finally, there’s the dream element. Now, I’ll be honest: I don’t really want to meet characters from the new worlds yet. Given the sneak peek nature of it, the characters from the new worlds would normally only be in there if they explored the story, which is numbered Kingdom Hearts territory only. If Disney gives them authority to make new stories within the realm of the existing stories, I’d be okay with that, particularly if they could make an adequate prequel that incorporates the strong side of the dream element (I’m almost there). I doubt that Disney will give them the license to explore those options though, so I hope they don’t introduce the characters in 3D so that we can explore their stories more appropriately in Kingdom Hearts 3. But what will be a lot of fun if they do play with it is if they mix up worlds. Could the dream aspect of 3D offer some new possibilities for overused worlds? Maybe a spliced version of Agrabah and Wonderland? What madness is this? Well, think about it. Let’s say The Black Cauldron and Atlantis were put into this game. Take those two worlds, slice them up into parts, and throw them into a bag. Shake it, toss it, twirl it, pour it out, and rebuild the two into one world like legos. Can you imagine the world design results? It would be evocative, challenging, imaginative, and it would build on one of the basic ideas of the game series as a crossover. If they do incorporate characters, I wouldn’t mind revisiting some of the old worlds for both the idea of new designs and the idea of having Jack Skellington and Jack Sparrow in the same area. Now, as it stands, this probably won’t happen, but there’s still a point here: when the story is set in a dream, the means of exploration expand exponentially. Alliteration aside, I think that Square Enix will take advantage of that in ways beyond the plain old weird raining Sora phenomenon, and that aspect can lead to a different kind of story for Kingdom Hearts that could really be exciting. Okay, so there’s some reasons the developers chose to go with 3D. There are a lot of things to play with and experiment with in terms of gameplay, storytelling and design. While I hold 3D’s contributions as a story element as highly questionable, the amount of things they could do with this experiment could lead to the game being even better than the normal games…Wow, did I just say that? Well, we’ll see. Arcane – Are you disappointed about Dream Drop Distance coming before Kingdom Hearts 3? Do you think 3D could be similar to Chain of Memories as far as being a bridge between Kingdom Hearts 2 and 3? What ideas do you think they could explore with the dream aspect of 3D? Give us your thoughts! Also, remember to come back to see Arcane‘s thoughts on Birth By Sleep Volume 2!